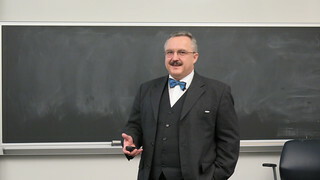 This post is about some research Prof. Martin Kreuzer, at the Univ. of Passau, does which combines Grobner bases and solving permutation puzzles, such as the Rubik’s cube. 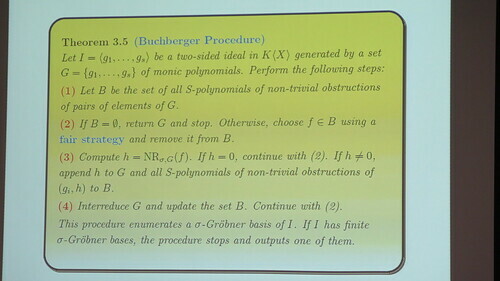 Non-commutative Grobner Bases and Twisty Puzzles was the title of his talk (the link takes you to his slides, which he kindly allowed me to post). is a two-sided ideal generated by binomials. First, Prof. Kreuzer introduces the non-commutative analogs of term ordering, leading term, and Grobner basis with respect to that ordering. The non-commutative analog of the Buchberger procedure. After developing enough theory, it turns out that the word problem in group theory can be re-expressed in terms of the membership problem for . 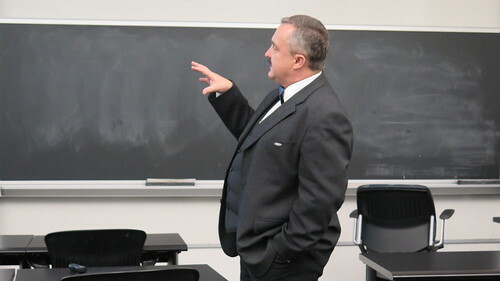 Prof Kreuzer discussing aspects of computational group theory. Martin Kreuzer defines a twisty puzzle as a special form of a permutation puzzle. Its pieces (usually called cubies) can be permuted by twisting certain faces of the puzzle. The cubies carry stickers defining their location in the solved puzzle. For example, with the Rubik’s Cube, the 54 stickers of a 3×3×3 cube can be permuted by 90 degree turns of the faces. The possible permutations form a group called the Rubik’s cube group. Then he gives the following definition and remarkable Theorem. Definition: Let G be a twisty puzzle group given via a set X of generating twists. (a) The graph whose vertices are the elements of G and whose edges are pairs of positions which differ by just one twist is called the Cayley graph of G.
(b) The diameter δ(G) of the Cayley graph of G is called God’s number for the twisty puzzle. (c) An algorithm which produces for every scrambled position p an element of X∗ whose length is the distance (in the Cayley graph) from p to the solved position is called a God’s algorithm for the twisty puzzle. (1) Compute a Grobner basis G of the defining ideal of the twisty puzzle group ring w.r.t. a length compatible word ordering. (2) Find any word w ∈ X∗ representing a sequence of twists that result in the position p.
(3) Compute NRG(w) ∈ X∗ and return this word. This is an algorithm which computes a word representing a shortest possible sequence of twists that produces p from the solved position. This has even been implemented on a computer in Cocoa, for a permutation puzzle with a very small group. 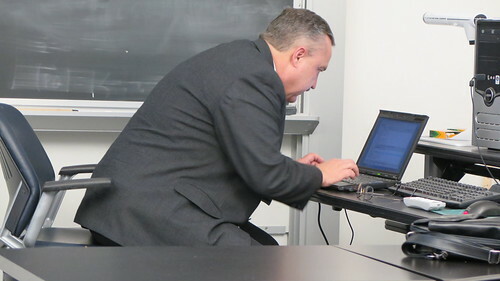 Prof Kreuzer at his laptop running a “toy” implementation of God’s algorithm.